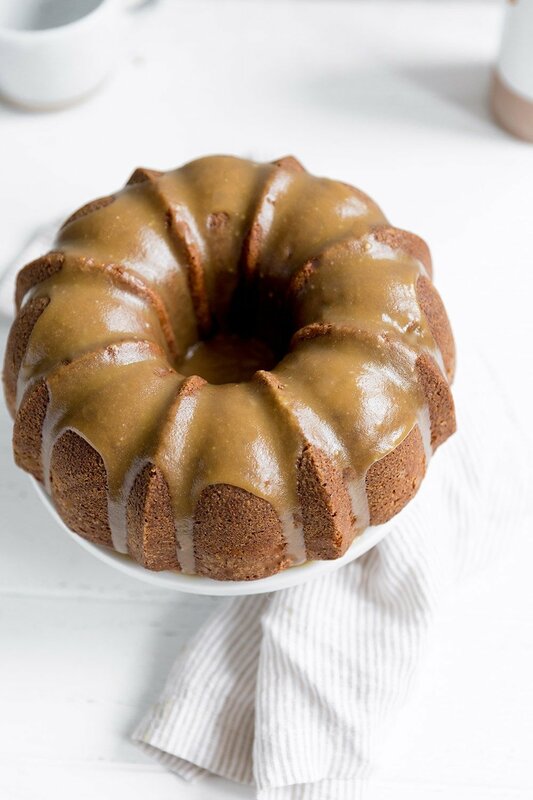 Butterscotch Bundt Cake features a brown sugar sour cream cake drizzled with a thick butterscotch icing for a simple and beautiful fall dessert. Taste: Tons of sweet, complex butterscotch flavor. Texture: The cake is moist and tender without being too delicate, while the glaze is rich and luscious. Ease: Simple and straight forward. Pros: Beautiful and scrumptious cake, perfect for fall! I feel like butterscotch is an underutilized flavor in the world of baking. Caramel, specifically salted caramel, seems to get all of the love and attention. Caramel is the Marcia of sweets, while poor butterscotch is the Jan. I think it’s time to change that a little. Butterscotch is equally as delicious and usually even easier to make or incorporate into baking from scratch. 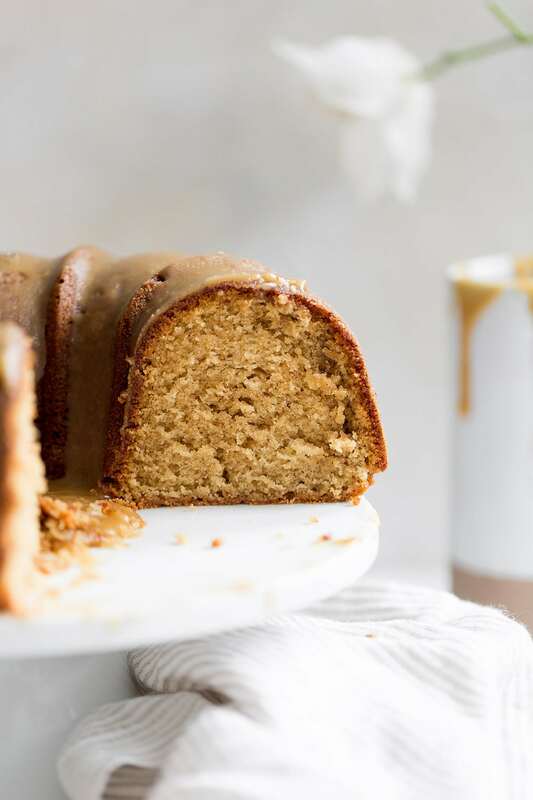 Take this Butterscotch Bundt Cake for example. Its cake base is made from a high ratio of brown sugar to granulated sugar, which lends that complex deeply sweet flavor that I crave so often. The glaze is where the true butterscotch flavor shines. It’s so easy to make. We basically combine butter, brown sugar, and cream in a saucepan and cook it for a few minutes. No thermometer required, no difficult steps. The only thing you have to be wary of? The glaze thickens and sets fast, so it needs to be poured onto the cooled cake soon after making. If it sets before you can use it, just reheat until it’s nice and pourable again. I added just a hint of cinnamon to this cake as well to accentuate how perfect it is for autumn baking. It smells like an absolute dream while baking! If you want to give this recipe a go, be sure to read through my baking tips below first. This recipe calls for a 10-inch bundt pan with a 10 to 12 cup capacity. I used this Wilton Bundt Pan with success. If you’re using a nonstick pan, be sure to hand wash it gently to preserve the nonstick coating. Even if the manufacturer says you can place in the dishwasher I would avoid it. I find hand washing extends the life of the pan and the integrity of the nonstick coating, which is so important with bundt cakes! 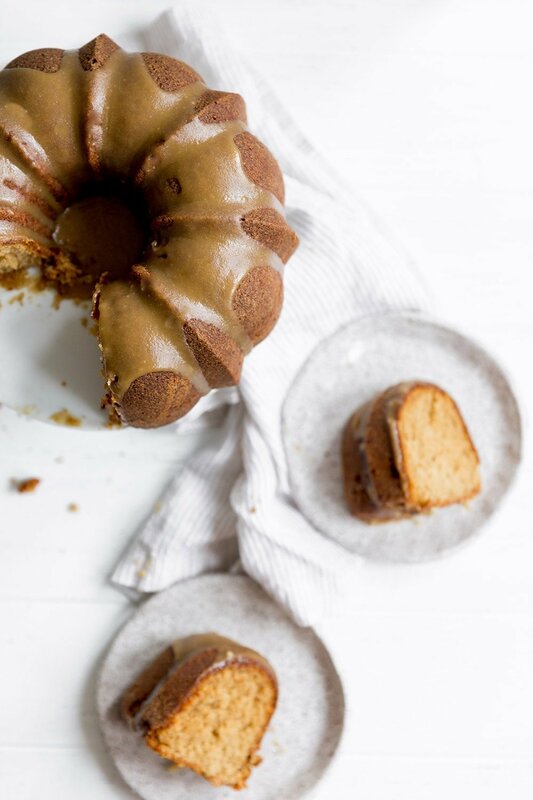 The bundt cake can be made ahead of time and stored in an airtight container at room temperature for up to 2 days. You can use a pretty cake stand with a glass lid to cover your cake if it’ll be on display, or a plastic cake carrier which works better for transporting. Tip #1: Use a good quality nonstick bundt pan without any scratches or damage to the nonstick coating. See more about the pan just above. The first time I made this recipe it released from the pan perfectly. I used my go-to bundt pan which I’ve had for years. The second time I used a friend’s bundt pan and it stuck to the pan a little. That’s why I recommend following tip #2 below if you ever have trouble with sticking. Tip #2: Coat your pan in whatever way works well for you to get a clean release. If you experience sticking, then generously coat your bundt cake pan with nonstick cooking spray OR melted shortening only. Use a pastry brush to really get into all of the nooks and crannies with the grease, including that center column. Do this just before you pour your batter in, so the grease doesn’t have time to slide down the sides and pull in the bottom of the pan. If you feel the need to flour your pan, a nut flour like almond flour works best. Tip #3: Once you remove the pan from the oven, let it rest right side up for a few minutes, then flip it onto a wire rack to cool some more. The upside-down position will help the cake slowly release from the pan, and it might just release on its own without much effort from you. The wire rack will prevent condensation from building on the cake itself due to the residual heat, which is why you should avoid doing this on a flat surface. Once the pan is cool enough to handle you can use a small plastic offset spatula (don’t use metal which may scratch the nonstick coating) to gently loosen the cake from the pan if needed before flipping onto your cake stand or serving platter. 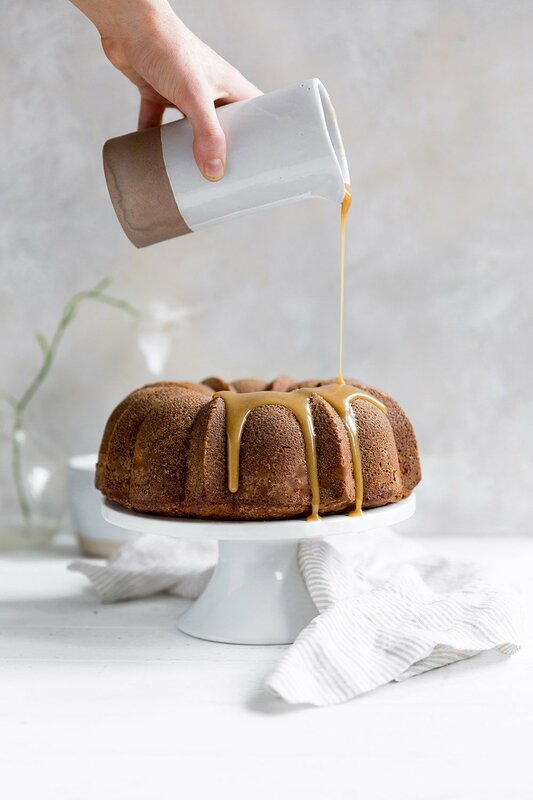 If you make and enjoy this Butterscotch Bundt Cake, be sure to snap a picture and share it on Instagram, tagging #handletheheat, so we can all see your creations! Make the cake:Preheat the oven to 325°F. Thoroughly grease a ten-inch bundt pan with nonstick cooking spray or melted shortening. To ensure the cake won’t stick, use a pastry brush to spread the grease into all the nooks and crannies. In a medium bowl whisk together the flour, baking soda, salt, and cinnamon. In the bowl of an electric mixer, beat the butter and sugars on medium high speed until very light and fluffy, about 4 minutes. Add the vanilla then the eggs, one at a time, until well combined. Add the sour cream and flour mixture in alternating additions, beating between each addition, until just combined. Pour batter into prepared pan and tap against the counter to release any air bubbles. Bake until golden brown, with a cake tester coming out clean, about 50 minutes to 1 hour. Flip the cake in the pan onto a wire rack and allow to cool for about 30 minutes before removing from the pan entirely. Make the icing:In a medium saucepan, melt the butter over medium heat. Add the sugar and cream and whisk to combine. Bring to a simmer and cook for 5 minutes, whisking occasionally. Remove from heat and stir in the sifted powdered sugar. Drizzle over the cake immediately. Let stand for 20 minutes, or until the icing is set, before serving. Store the cake covered at room temperature for up to 2 days. Note: Be sure to follow my tips for greasing the pan in the blog post to avoid having this cake stick to the pan! Preheat the oven to 325°F. Thoroughly grease a ten-inch bundt pan with nonstick cooking spray or melted shortening. To ensure the cake won’t stick, use a pastry brush to spread the grease into all the nooks and crannies. In a medium saucepan, melt the butter over medium heat. Add the sugar and cream and whisk to combine. Bring to a simmer and cook for 5 minutes, whisking occasionally. Remove from heat and stir in the sifted powdered sugar and salt. Drizzle over the cake immediately. Let stand for 20 minutes, or until the icing is set, before serving. Store the cake covered at room temperature for up to 2 days. Yes!!!!! I’ll be making this this weekend, sounds and looks delicious!!! I have to admit that I’m a sucker for butterscotch as well. I mean, it contains butter, so… 😀 This cake looks scrumptious, Tessa! Just finished making this! Your instructions are so easy to follow, and the cake came out perfectly! One question, for the icing, when do you add the salt? I sifted it in with my powdered sugar but I wasn’t 100% sure. You have your cook time listed as 25 minutes, but in the directions it says 50 minutes to an hour. Please advise. Thanks. moist delicious cake! I made it non dairy and it came out great!